He has ordered steep new tariffs on those imports to the U.S. The president says he will exempt Canada and Mexico as “a special case” while negotiating for changes to the North American Free Trade Agreement. The new tariffs will take effect in 15 days, with America’s neighbors indefinitely spared “to see if we can make the deal,” Trump says. He suggested in an earlier meeting with his Cabinet that Australia and “other countries” might be spared, a shift that could soften the international blow amid threats of retaliation by trading partners. One Republican senator is promising to introduce legislation to nullify President Donald Trump’s new tariffs on steel and aluminum imports. Trump’s exemptions on steel and aluminum products from Mexico and Canada did not satisfy lawmakers. Another GOP bill would require Congress to approve trade actions, but it’s doubtful the GOP-led Congress can muster the votes to block Trump. Trump says a 25 percent tariff will be added to steel and a 10 percent tariff will apply to aluminum. 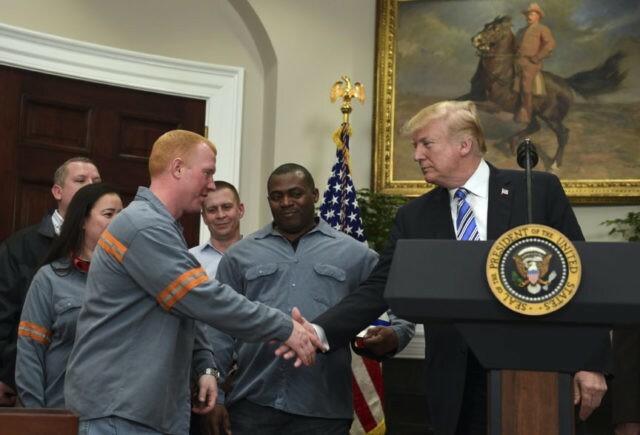 The president was surrounded by steel and aluminum workers as he explained his decision at a White House ceremony. He signed separate proclamations ordering the tariffs. Trump says the levies will take effect in about 15 days. He says Canada and Mexico could be exempted based on the outcome of talks to renegotiate the North American Free Trade Agreement. Trump invited the workers to speak. Several spoke of how excessive “dumping” of steel and aluminum imports had negatively affected their jobs and families. President Donald Trump says his decision to impose tariffs on steel and aluminum imports fulfills a key campaign promise. He says politicians have for years lamented decline in the industries, but nobody has taken action. Trump’s audience includes a number of steelworkers along with administration officials. Trump says the excess of imported steel and aluminum is a “travesty” and hurts American workers and industry. Sources outside the White House say President Donald Trump’s tariffs on steel and aluminum imports will take effect in 15 days, with Canada and Mexico indefinitely excluded from the duties. Trump is ordering import tariffs of 25 percent on steel and 10 percent on aluminum later Thursday. He says American manufacturers need to be protected on national security grounds. The people briefed on the plans say all countries affected by the tariffs are being invited to negotiate for exemptions, if they can address the threat their exports pose to the U.S.
Those briefed on the plans say the exclusion for Canada and Mexico could be ended, if talks stall to renegotiate the North American Free Trade Agreement. The people were not authorized to discuss details in advance and spoke on condition of anonymity. The White House says President Donald Trump will sign orders to impose tariffs on steel and aluminum imports on Thursday afternoon. The president suggested earlier Thursday he would provide temporary exemptions for Canada and Mexico as he aims to revise the North American Free Trade Agreement. Trump also suggested Australia and “other countries” might be spared. The announcement comes amid a last-minute lobbying effort to blunt the impact of tariffs. President Donald Trump is suggesting that Australia and “other countries” may be exempted from steel and aluminum tariffs, along with Mexico and Canada. Trump is expected to delay the imposition of tariffs on Canada and Mexico to turn up the pressure in negotiations over the North American Free Trade Agreement. President Donald Trump says he’ll hold an afternoon meeting on the steel and aluminum industries. The president did not say whether he will sign tariffs on steel and aluminum imports at the meeting. The White House has not yet clarified the tweet. The White House says Mexico, Canada and other countries may be spared from President Donald Trump’s planned steel and aluminum tariffs under national security “carve-outs,” a move that could soften the blow amid threats of retaliation by trading partners and dire economic warnings from lawmakers and business groups. The update came as congressional Republicans and business groups braced for the impact of expected tariffs of 25 percent on imported steel and 10 percent on aluminum, appearing resigned to additional protectionist trade actions as Trump signaled upcoming economic battles with China.